When the World Was Black: The Untold History of the World’s First Civilizations (Volume Two of The Science of Self series) has been published in TWO parts. Why two? Because there are far too many stories that remain untold. We had over 200,000 years of Black history to tell – from the southern tip of Chile to the northernmost isles of Europe – and you can’t do that justice in a 300-page book. So there are two parts, each consisting of 360 pages of groundbreaking history, digging deep into the story of all the world’s original people. 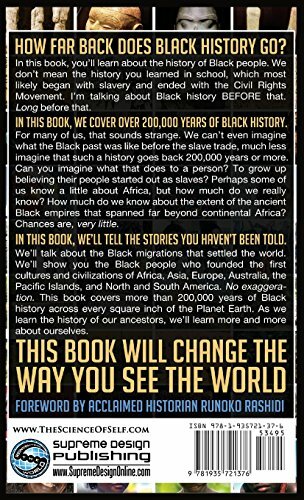 Part One covers the Black origins of all the world’s oldest cultures and societies, spanning more than 200,000 years of human history.